I’ll be honest: I’ve enjoyed multiple winemaker dinners this year, and each one was first-rate. But the most recent meal was made extra special by the fact that the winemaker, Aaron Watty of Big Tar Wines, was also the chef. 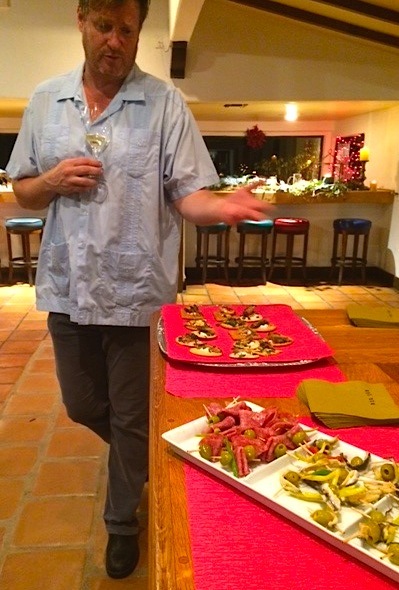 On Dec. 7, at the cozy Montecito Events Center (a former restaurant), Watty and his adorable mother, Kathleen Watty (aka “Momma Watty”), and guests enjoyed a multicourse “Winemaker as Chef” dinner and appetizers paired with Watty’s wines. Watty, a native of San Luis Obispo, has a curriculum vitae that impressed me back when we first met in 2007 at Allan Hancock College in a enology class. Growing up, Watty resided in Tahoe and Paris, and graduated from UCSB. While still a student, Watty worked in the fashion business in New York City, Milan and Paris. And then came many years in the restaurant industry, first in New York City and Miami, and then on the West Coast, in Truckee. Upon his return to Santa Barbara County, Watty began waiting tables at Santa Barbara’s famed bouchon in 2006. To this day, he still works several shifts a week — that is, when he’s not making wine for himself or another producer. Also in 2006, Watty began at Sunstone, where he worked in sales until 2008. Then he worked a year as wine director at the Wine Cask, and with Doug Margerum, making wine for Margerum Wine Co., for two vintages. Following came harvest and cellar stints with a custom crush, Sans Liege and Longoria Wines. Watty launched Big Tar in 2012 with an emphasis on bordeauxs from the Happy Canyon AVA: A Three Creek (3C) Vineyards sangiovese, sauvignon blanc from McGinley Vineyard and cabernet sauvignon from Happy Canyon, and pinot noirs from both Rio Vista and La Encantada vineyards. I tasted through his wines a year ago this month at a private tasting for small producers, and I was eager to see how they’d matured and developed in one year. I know several winemakers whose talents in the kitchen match their skills in the cellar, and Watty is on that short list. 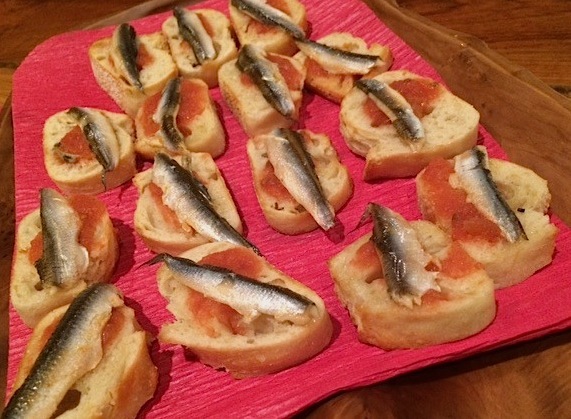 On Dec. 7, dinner guests gathered to sample appetizers: Bouqerones with peppers and olives, smoked sardines with cumin crema, olive, pepper and salami. Paired with these delights were Watty’s 2012 Three Creek Sangiovese and 2014 McGinley Sauvignon. When guests seated themselves for dinner, Watty and his wait staff poured another sauvignon blanc, this one another 2014 from McGinley Vineyard, aged in neutral oak and bottled just three weeks prior to our dinner. It was paired with local black cod. Watty purchased all of the meal’s vegetables from the Saturday Santa Barbara Farmer’s Market. From the arugula beurre blanc and white beans served with the cod, to the wild mushroom encrusted Alaskan Arctic Char, served on a bed of spinach, all the vegetables were first rate. The char was delightful with the 2012 Big Tar La Encantada Pinot Noir, with the wine able to stand up against the spice of the mushroom crust. The third course was three plates, and paired with three red wines: Roasted pork loin with prunes and potato gratin, paired with 2012 Happy Canyon cabernet sauvignon; char grilled leg of lamb with lentils francaise and carrots, paired with 2012 Cuvee Jean Murphy (named for Watty’s late grandmother); and to finish, Basque sheep cheese with membrillo and honey with black pepper, paired with the 2012 Rio Vista pinot noir. Our table agreed that the lamb with lentils and the cuvee scored for best pairing, hands down. Watty’s 2012 cuvee is 70 percent sangiovese from Three Creek, and 30 percent Star Lane Vineyard cabernet sauvignon, and very limited, as he produced just one barrel, or approximately 28 cases.